Winning the Lottery: What are Annuity Payouts? Before getting to enjoy a single cent of their winnings, lottery winners must choose whether they want their winnings right at that moment or be paid every year instead. This is an important decision—one that could affect your life, depending on your current financial status and other relevant factors—so don’t take it lightly. But, which one should you go for? Some suggest taking the lump sum route – which isn’t a bad idea. But don’t count out the annuity option just yet! Join me as I take a closer look at what exactly annuity is and what choosing it entails. What is an Annuity Payout? Basically, annuity payouts mean that you receive your payments annually for a predetermined number of years. How long annuity payments last differs depending on the lottery. Usually, it takes at least 20 years for annuity payments to be completed—at the most, it could take up to 30 years. Should you decide to go for the annuity option, the lottery agency takes the cash prize and invests it on highly stable things—like U.S. Treasury bonds, for example. They assume responsibility of any and all risks pertaining to the investment while guaranteeing your payments. In other words, for the next 20 to 30 years, not only will you be receiving annual payments, going for the annuity option also entitles you to some investment income. Sounds great, right? That’s just the tip of the iceberg. Below, I list down all the reasons why the annuity option is advisable—and, in some cases, not advisable. Why Should You Choose an Annuity Payout? As I mentioned earlier, you get guaranteed annual income—with investment interest—for the next two or three decades. When a winner passes away before the entire winnings have been paid out, most lotteries allow the payments to be passed on to the winner’s beneficiaries or estate. It’s just like any other asset, for that matter. You only need to pay a tax bill once if you go for the annuity option. Finally, the annual payment scheme can be a form of protection. That is, it protects you from yourself. Data shows that most lottery winners tend to overspend and fail to save a significant portion of their winnings, so the annuity option can help prevent you spending more than half of your winnings all at once. Why Should You Avoid an Annuity Payout? Depending on your current financial status, 20-30 years might be too long. That is, the money might not retain its value over the course of several decades (income-tax rates could change, etc.). If you pass away before the annuity ends, your family members end up paying estate tax on whatever amount of the money is left. Some lotteries, like the US Powerball, allow the money to be converted to a lump-sum in case of your death though. If you can live with receiving small portions of your entire winnings for the next 20-30 years, going for the annuity option is a smart move. Not only does it provide a guaranteed annual income—with interest and minimal tax to boot—but it also allows you to manage your money better. 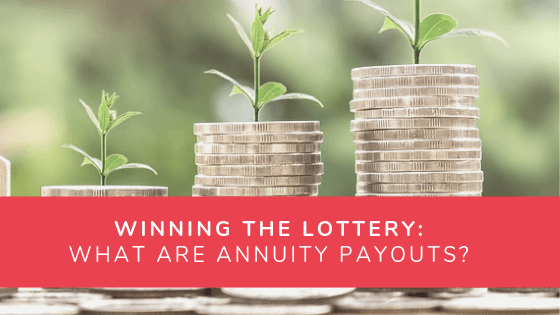 All too often, a lot of lottery winners who opt for a lump sum, spend way too much of their winnings in a short amount of time, but going for the annuity option helps prevent that. Of course, some people can still mismanage their winnings even if they choose to go for the annuity option—which is why it’s important to get from financial planners/advisers. So, if you win, keep in mind that you need to plan how your spend your money, even if receive your winnings annually.